Have you ever wondered what it feels like to go back in time, coming face to face with something that is thousands of years old? Though time travel isn’t possible (yet), walking on a glacier that was formed during the last ice age sure is. Bonus: the glaciers in Patagonia hold water that is some of the purest on Earth. Tours go every day from the nearby town of Puerto Rio Tranquilo over to the Exploradores glacier, which is a few hours away. After Steve showed photos of it to me on Google images, I was 100% down with the glacier hike. Tours only started on Exploradores a few years ago, opening up a new revenue stream for the town of Puerto Rio Tranquilo and increasing tourism. In the grand scheme of things, even access to the town of Pto Rio Tranquilo is new. Prior to the construction of the Carretera Austral in the late ’80s, this was one of the most remote places on Earth. The groups are of about 20 people plus two guides, roaming in a single file across the glacier. In this case a guide is a necessity. They’re not only required in the national park, but also essential to not falling into a crevasse. They know the routes, and where to find the best photo opportunities. Down south on Perito Moreno or Glacier Grey, the costs for a tour are about double (this one only cost around USD $60), and the photos I saw from those didn’t compare to those from our trek. Perhaps it’s a different kind of glacier or with more people, slightly tighter regulations, but I loved what I ended up seeing (and editing later that evening). The hike starts through a forest path for about an hour before coming to a glacier moraine. The thing about moraines is, like the glaciers, they’re constantly moving. This means there is no specific path and it’s a game of jumping from boulder to boulder and sometimes climbing with hands and feet. This lasts for a couple of hours as well. Not to worry, though, because if you get thirsty you can always count on the fresh water coming directly from the glacier! And you’ve got to stay on your feet! Eventually the rocks make way for ice. Crampons on, the feeling of walking on the ice is akin to that of the satisfying crunch from jumping on autumn leaves. It’s crisp and it crackles. We were taught how to stay upright and how to climb up and down the slopes of the glacier. I felt that chances were good that nobody would fall into a crevasse, but given how steep some of the ups and downs are, I could have quite easily, at the very least, fallen flat on my face. I’m just that coordinated. New ice caves are opening up and closing off all the time as the glacier recedes, as they are doing globally. Some of the ice waves and corners we crawled into and through are probably not even there anymore, and that was just a couple of months ago. At some point during the day it hits you, while surrounded by such baby blue water, giant mountains that frame the glacier, also covered in glaciers and waterfalls of their own, that this is a special place. There aren’t that many places in the world with that much ice, so few tourists, and so many adventurous options. No wonder Patagonia has long enthralled adventurists and sat so high on the bucket lists of so many travelers. Yet so many of them pass this opportunity right up, because it’s not the easiest place to get to. So they go straight to the south instead and bypass most of Chilean Patagonia. You know what? That’s just fine with me, because the remoteness makes it all the more alluring. But if you’re welling to go the distance, I hope that you make it there, too. And while you’re at it, check these marble caves out! Getting There: Take a tour from Puerto Rio Tranquilo. They depart daily and there are many companies where you can book in person. I went with and can recommend Explora Sur, which charged 45,000 CLP. The same company also runs boat tours to the marble caves which take off multiple times daily from town and last a couple of hours. Wear: Something that isn’t baggy. I had wished my baggy pants had just been left at home because you can trip on them and go flying into a crevasse. Also bring hiking boots appropriate for all of the rocks, gloves, waterproof clothing, and sunscreen. Sleep: Either in campgrounds if you have a tent, or at one of the guesthouses in town. It’s best to arrive and ask around. This definitely looks like a fun experience! However, it was also a bit dangerous as the ice is very tricky and falling into a crevasse is quite easy. For sure and it would be very foolish to go without a guide. Haha awesome. Honored to be an inspiration! I’ve walked on a glacier Alberta, Canada and came away thinking ‘meh, kinda just like walking around in winter’ but your experience was absolutely amazing! I actually got tingles when you were talking about how it is one of the few remote places left in the world. Such an adventure to climb on and through a beautiful glacier like that one. I’ve seen photos of other glacier hikes and they didn’t go in the ice caves and the ice waves. I guess it’s a different kind of glacier (I’m no expert in these things) or maybe safety regulations preventing guides from taking people into these things haven’t hit this area yet. Was super cool! I’m definitely a sucker for a good glacier, and this one looks amazing! I’ve been glacier hiking a few times, but never into ice caves/waves like those! Just one more reason to bump Patagonia up to the top of my list! Where did you stay in Puerto Rio Tranquilo? I am not finding much online. Will be taking a long bus ride from El Chalten, because I can’t miss this while I am there. How many days do you recommend for this spot? Thanks! You’re not finding much online because there’s not much internet there. It’s small mom and pop homestays and I just arrived and looked around. Can’t remember the name of the place now but that’s how the Carretera Austral was. Arrive and look around. I’d give it at least 3 days to allow for weather! Your tip about not wearing baggy pants is spot on, especially when wearing crampons! Do you know if the outfitter or guides ever offer any multi-day/overnight trips? I don’t see in your picture hikers walking with hiking pole? Any reason? Can I rent spiky hiking shoes there? is there any age restriction? Can I take my 12 years old? We didn’t use hiking poles on the glaciers, but we did use crampons which they provided. I didn’t see kids that age so I would ask the tour company! Pls advice whether Dec is good month to visit this place. Thanks for posting your article. Should be! I’m not sure though, always depends on the year. Hey Kristin! I’m planning a 3 week Patagonia trip. Planning on doing TDP, Fitz Roy, Torres, and all the good stuff. I would love to check out Puerto Rio Tranquillo. What is the best way to get there from Puerto Natales or El Cafate? Which tour company did you go with? Would love to return, you? Yeah same I’d love to go back. Will probably do so in 2019! Our son is spending a month hiking around Patagonia before we catch up with him to do TdP W hike in mid October. I’ve been reading about your 10 best hikes in Patagonia and they all look pretty amazing! I’ve noticed that you do a bit of hitch hiking to get around. He’s travelling on his own, but hoping to meet fellow hikers in Puerto Natales and go from there. Do you think it’s pretty safe to hitch hike around Patagonia on your own generally? I like the way you started at the top and worked your way south, he flys into Punta Arenas and will then bus to Puerto Natales. He’s then thinking of bussing it up to say Bariloche and hike and travel back from there. It’s quite common to hitchhike along the Carretera Austral, however it doesn’t sound like his trip would involve that road if he’s traveling between Punta Arenas and Puerto Natales. It’s easy to bus between those two places and from there, I’d probably bus over to Argentina’s El Calfate and fly up to Bariloche. It depends on how much time he has and whether he wants to involve the Carretera or not. There are so few buses on that road most people end up hitchhiking and I thought it was fine but it, of course, always comes with risks. Love your top 10 list. I am trying to do as many as possible of them while I’m here. I’m Currently in Bariloche waiting for the weather to clear. I really want to see the Exploradores glacier but have a hard time finding a good way down there from here. Any suggestions? You could go down to Patagonia on the Argentinian side and cross over to Puerto Rio Tranquilo or go down the Carretera Austral but that’s the slow, adventurous method. I was wondering if the glacier + the caves was a 2 days thing for you, or if these are doable in 1 day. Say the glacier in the day, while boat tour to the caves in the afternoon. You mentioned the caves are a couple of hours. Are these 2 doable in a day? I think it’s probably doable, yes. Thank you for your posts. 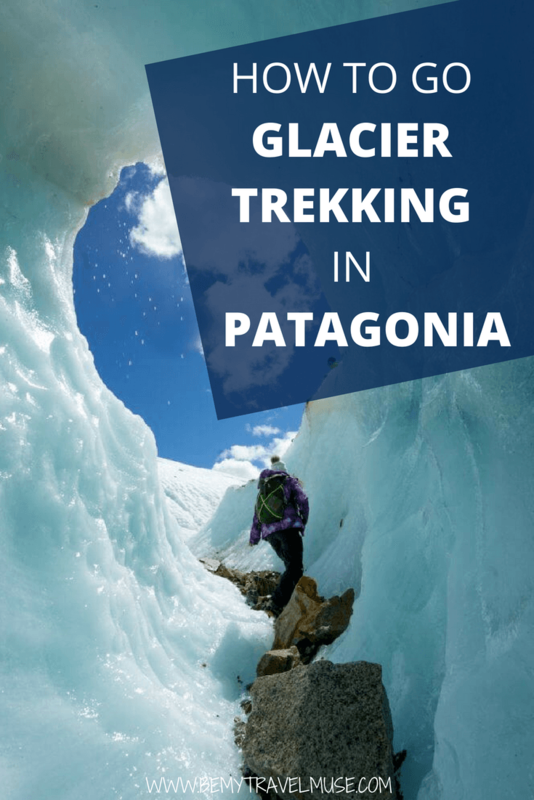 Because of this one I have decided to do a side trip from the original Patagonian plan and explore Exploradores Glacier as you did. My problem is following, Google shutdown reCAPCHA and in order to email Explora Sur you need to confirm you are not a bot, this is no longer possible because the haven’t replaced original reCAPCHA with anything else. Do you have their direct email where i could email them and book the tour? I am flying to Buenos Aires in two weeks and working my way up North and then down south trekking through Patagonia. I have only a month to do all. And i just can’t stop talking and thinking about it all day every day. Oh dear, that’s annoying! Can you use a different browser than Chrome, or is that not the issue? I actually booked this in person the day before, which shouldn’t be a problem. Unfortunately I don’t have any direct contact info, but I believe most people probably do just show up and book in person. Hope that helps!